Nicola Pullan, Assistant Curator of Social History, Leeds Museums , will be answering your questions on the Leonora Cohen Suffragette Collection on Wednesday 26 November 2014 between 11am -12 noon BST. At Leeds Museums we are very lucky to have a collection of material that was donated to us by Leonora Cohen. 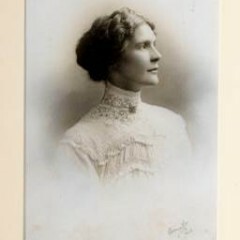 For anyone who isn’t aware of her, she was Leeds’ most famous suffragette. She was born 15th June 1873 and remarkably lived until 105, passing away on 4th September 1978. 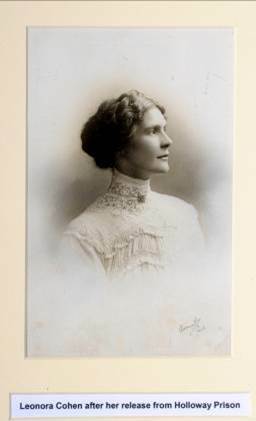 Whilst she may not be that familiar a figure in the suffragette movement, she was involved in the WSPU, campaigned on workers’ rights and was involved in trade unions, and even opened a guesthouse in Harrogate where suffragettes who were released from prison under the cat and mouse act could stay once her own health started to suffer from her prison experiences. Her most renowned act was to smash the glass in the case that held the crown jewels in the Tower of London. She was arrested and charged, and defended herself in court. She was successful and escaped conviction as she found a tradesman to testify that the damage to the case would cost less to repair than the amount listed in the criminal damage charge against her. She deposited a large collection of papers and other material with Abbey House Museum in the 1960’s as a way of helping to preserve the stories of women like herself. The stories of women such as the Pankhursts, who were renowned for their role in the cause, had already been recorded. Yet working women like Cohen were just as important to the cause – they attended rallies, educated people around them, campaigned and were imprisoned for their beliefs. My favourite item in the collection has to be her scrapbook – complete with the odd annotation in purple ink. Whilst it does not tell the whole story of her campaigning, it does give a great insight into ideas and causes that interested her. There is even a photograph from a march to Woodhouse Moor in Leeds where thousands of people gathered in support of women’s suffrage. We are currently starting to look more closely at the Cohen collection for two reasons. Firstly, with all eyes looking to World War 1, it is a source of contemporary material from the period. Whilst there are not many items relating to the war or what Cohen was up to, there are a couple of speeches (one given in America by Christabel Pankhurst, another from the WSPU in Huddersfield) highlighting the different positions of women and WSPU supporters during the war period. There are also a couple of excerpts in her scrapbook that suggest she was maintaining her awareness of current affairs, particularly relating to women – one relates to the death of nurse Edith Cavell, and another on women doctors. However, most importantly, it will be 100 years since some women were first able to vote in 2018. Making sense of the collection now and understanding what material we have, will enable us to look at how best to commemorate such a milestone as the anniversary approaches. We are also trying to increase awareness of this wonderful collection now, so that researchers outside the service have an opportunity to access it for their own research. 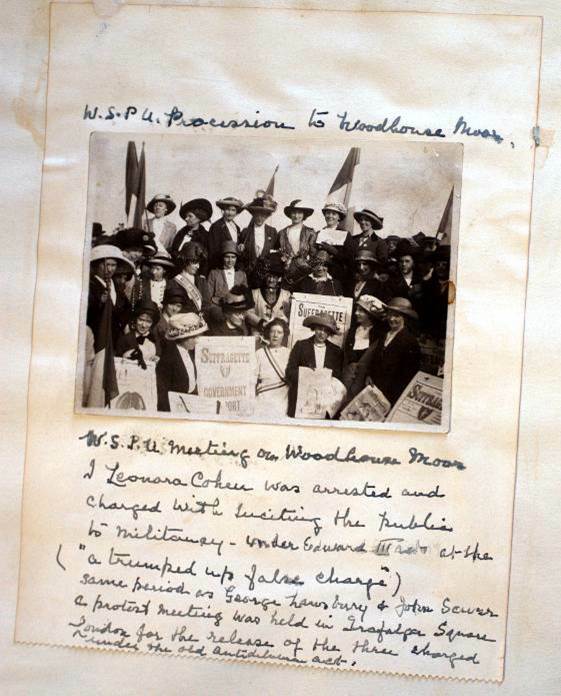 We have also recently begun offering a Leonora Cohen study day for anyone interested in women’s and particularly suffragette history – which gives all participants a chance to look through some of her collection themselves. I’m looking forward to hearing what questions people may have about Leonora and our collection – and will try answer anything I can to the best of my ability. You can see some of her physical items on display in Leeds City Museum, and can arrange research visits to see the collection via myself at Abbey House Museum. You can post questions before the Q & A session, on 26 November, or you can converse in real time with our expert. You can use the comment box below to post a question, or you can use twitter with the hashtag #mdyask. Comments have to be moderated, to protect the blog from spam, so if your comment doesn’t appear straight away, don’t worry. We’ll get to it as quickly as we can. If you have ideas for subjects you’d like to see us cover in future, or would like to take questions yourself, please get in contact with us and let us know. Do you have any pop up suffragette dolls in the collection – the kind that were sometimes posted through letter boxes? If so do you know about how the use of these were coordinated by the anti suffragette movement? I have seen several and they are all different yet seem almost to have been made to a standard description without any one making one having seen another one. What a remarkable woman – I’d love to know more about Leonora’s scrapbook. Where did she source her ‘scraps’ from, and was it a common activity for women at the time? Dear Jane Henderson. Sadly we do not have any Suffragette dolls in our collection – most of the items we have are actually ephemera and paper based objects with only a few other items. These include a feeding tube and funnel, suffragette tea service, a dress she made for the Leeds Arts Society Ball in 1914 and a replica of the metal bar she used in the Tower of London. 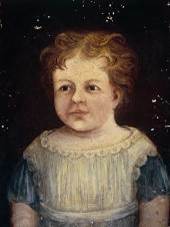 I’m afraid I also don’t have much information about the dolls themselves, it’s not something I’d come across before, but I did manage to find some information about one held in Welsh collections: http://www.peoplescollectionwales.co.uk/items/29232 . Dear Rachel, The scrapbook is a lovely object, in fact perhaps my favourite item in the whole museum collection. It is mainly made up of newspaper cuttings from both local and national press – but sadly a lot of the titles of the newspapers are missing from the clippings. 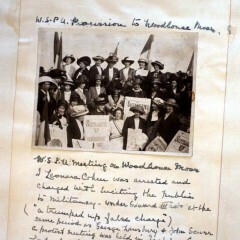 The inside of the front cover is decorated with WSPU paper shields, and her name is written in purple ink. There is also a lovely photograph from a march to Woodhouse Moor in Leeds which is stuck onto a piece of paper explaining how she “was arrested and charged with inciting the public to militancy”. She liked to correct the articles where appropriate, so some feature purple ink and arrows pointing to the offending parts. Unfortunately it is not a comprehensive history of her campaigning, with the dates jumping about wildly and articles appearing about women’s progress from the 1950’s, but does feature interesting insights into women’s employment, women and war, and particularly campaigns of her fellow Suffragettes. Scrapbooking in general seems to have been a popular activity at the time, we have several other from the period in our collections, and it seems both men and women could take part. Leonora sounds fascinating! You mention she was a working woman- what was her occupation? Thanks for the question Gillian. She worked in textiles, seamstressing and millinery in the first instance. By 1914 when war broke out she was involved in Trade Unions and also involved herself with the Lady Mayoress’s Committee who carried out a wide range of roles in the war – from fundraising and food control to making bandages. Like so many women, we don’t have much record of this as she appears to have been just getting on with it! Eventually she went on to become a JP and magistrate, and received an OBE in 1928 – no mean feat for a former jalbird. One of my favourite stories is her visit to Armley Prison as a JP – they showed her entry in their register only to realise she had never been fully released from her sentence as she had been discharged through the Cat and Mouse Act! Oh my goodness! What happened to Leonora? Was she re-incarcerated? How did she get her OBE- was this recognition for her work with suffragettes? Dear Gillian – Don’t worry, they didn’t put her back in handcuffs! I think it was one of those oversights that just wouldn’t happen nowadays. She was awarded her OBE for services to public life, we have her invitation to the investiture in the collection. This will have reflected on her work with unions, trades councils, her magistrate and JP work as a well as her contribution to the ‘Votes for Women’ campaigns. ‏@katewilloughby8 asks Do you know if Leonora Cohen met Emily Wilding Davison? Hi Kate. I’m not sure whether they did come face to face or not, but Leonora was definitely aware of Emily as we have some material related to her death and funeral in our ephemera collections. Leonora. I know Leonora did travel to London to participate in events and actions, so it is not out of the realms of possibility. Leonora’s scrapbook sounds such a fascinating item, it must have been a real labour of love for her to compile and must offer such an interesting insight into her life, personality and what was happening at the time. It is really lovely to find out that other men and women of the period made scrapbooks too as I keep one myself – though it’s not quite as interesting as Leonora’s! Many thanks Nicola, it has been great to learn about a local suffragette. Oddly, in a collection of books that I have on esoteric matters, the are a number that were owned by Leonora Cohen, and are signed by her inside. Also amongst them are a couple of letters that imply she was a member of a Masonic-type group. From the books and the notes, she definitely had quite a heavy interest in alternative spirituality. Thanks for getting in touch, that’s really interesting to know. I will inform our Curatorial team and if this is something they wish to look into further then I’m sure they will be in touch.